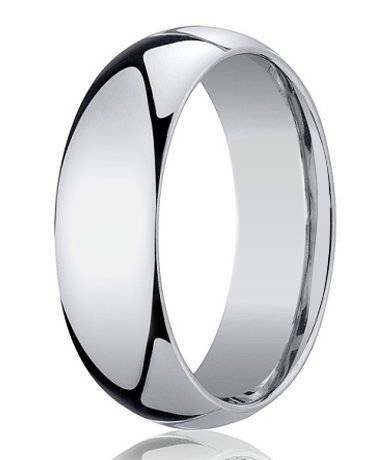 Did you know you can attain the same cool and silvery tones of platinum by choosing white gold for your wedding band? White gold is an excellent alternative to platinum, silver, titanium, palladium, tungsten carbide, or stainless steel. We believe you will find everything you or your groom are looking for in our men’s 7mm domed comfort fit 10k white gold wedding band. White gold is truly unique in that it gets its color by mixing pure gold with alloys such as palladium, zinc, and nickel to create that classic white hue that is as timeless as your commitment to each other. Celebrate your union in the best way possible by discovering the delightful benefits of choosing our men’s 7mm domed comfort fit 10k white gold wedding band. White gold is famous for its durability and scratch-resistant qualities. Complement the glimmer of your ear-to-ear smile with a stunning men’s 7mm domed comfort fit 10k white gold wedding band on your special day. This wedding band is very easy to clean by yourself at home or by bringing to a professional jeweler for a low price or, sometimes, for free! We especially love white gold as a choice for wedding bands because the minimalist design serves as the perfect canvas should you or your groom decide to add gemstones, engravings, or other intricate embellishments later on.